After we’ve published our series on recommended settings for Nikon D600 / D610 and D800 / D800E DSLRs, we received a lot of requests from our readers to provide similar information for Canon and Sony cameras. While using someone else’s camera settings is probably not the best way to achieve the best results in every situation, we understand that many different menu options can be rather overwhelming for those who are just starting out. Therefore, the below information is provided as a guide for those that struggle and just want to get started with a basic understanding of important menu settings. Before going into the camera menu, let’s first get started on the exterior controls. 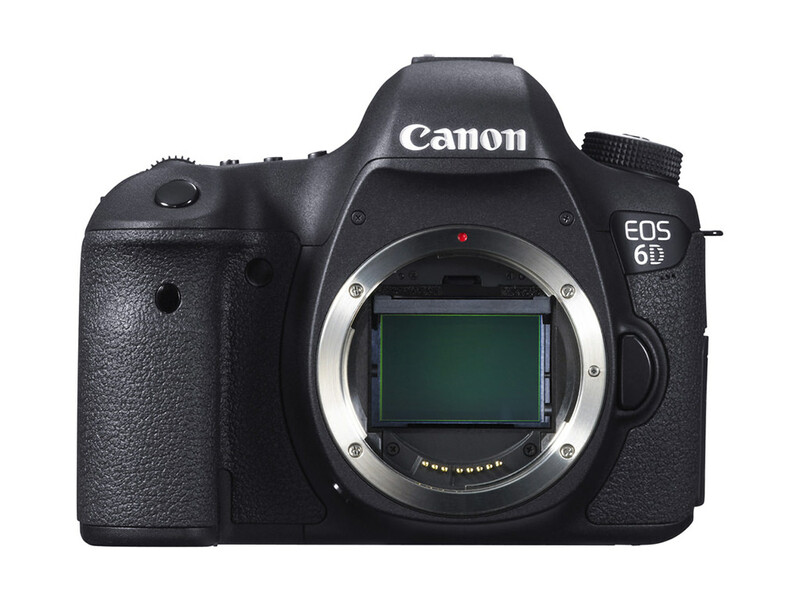 The Canon 6D has a lot of menu options, but there are some things that you can only control with the external controls. In addition, even if menu settings provide options to change particular settings, using external buttons / controls is simply faster. If you don’t know where to start, keep the setting on AI Focus, which will let the camera decide on how to focus in different situations. Single Drive – pressing the shutter release button will only fire one shot. If you continue to hold, nothing will happen. Continuous Drive – pressing and holding the shutter release button will continuously fire the camera at a speed of 4.5 frames per second. Silent Single Drive – similar to the first setting, but the mirror is raised slower for less noise. Silent Continuous Drive – similar to the second setting, but the mirror is raised slower for less noise when firing continuously. Unless you are planning to photograph action (sports, wildlife, etc), keep the camera in either Single Drive or Silent Single Drive mode. Personally, I like the Silent Single Drive mode compared to the Single Drive mode – the combination of the mirror and shutter sounds is very damp, which is nice. Next we have the ISO button for changing between different ISO sensitivity levels. Once you press the ISO button, rotating the top or rear dials will toggle between Auto ISO and regular ISO levels like 100, 200, 400, etc. all the way to ISO 25,600. Personally, I am a fan of the Auto ISO setting, as it automatically selects the right ISO for me depending on the brightness of the scene. If you are a beginner, I recommend using the Auto ISO setting, the behavior of which can be fine-tuned in the camera menu (as explained in detail further down below). The fourth button from left is used for switching between different metering modes such as Evaluative, Partial, Center-Weighted Average and Spot. Once again, I won’t go over each mode in detail, as you can read my Camera Metering Modes article, where each metering mode is covered in detail. If you do not know where to start, keep your metering mode in the default “Evaluative” mode, which is the one that looks like an eye. 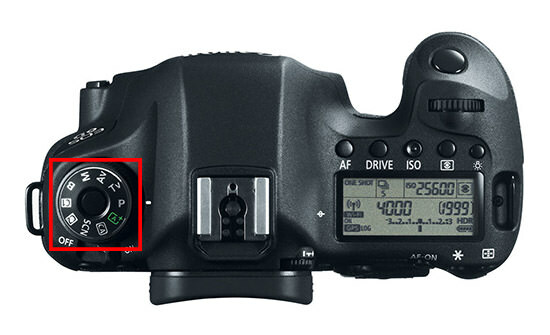 On the top left side of the camera you will find a camera shooting mode dial (often referred to as the “PASM” dial). I have my dial set to “Av” (Aperture Priority Mode) 90% of the time, because the camera does a great job in giving me good exposures. Once you get to know the camera better, I would recommend to explore the “C1” / “C2” settings (more on this below under Setup Menu), because they could save you time when switching between different shooting environments (say when switching between photographing landscapes to running kids). Some situations, such as when photographing panoramas or using off-camera flash call for using the Manual (M) mode, but I would only recommend to use this mode when you get comfortable with the exposure triangle. The Canon 6D has a number of buttons on the back of the camera that also serve particular needs. To the top right of the camera, you can find three buttons: AF-ON, AE Lock (Asterisk) and AF Area Mode. The AF-ON button can be used in conjunction with the Custom Functions (see below) for “back-button AF” that you can use for the focusing and recomposing. There is one more button on the back of the camera that can be quite handy for making quick adjustments to the camera and that’s the “Q” button that is located to the right of the magnifying glass and playback buttons. I love this button, because it serves as a shortcut to get to the most important settings without having to dig through the many menu items. It gives you access to the exposure triangle, exposure and flash exposure compensation, WiFi, picture styles, white balance + white balance shift, auto lighting optimizer, custom controls, AF operation, AF point selection, drive mode, metering mode and image size / quality settings. So this button is a great shortcut to seeing a summary of all settings on the camera that are currently applied. From here, you can override the top buttons easily by simply using the multi-controller on the back of the camera. Release shutter without card: OFF / Disable – you do not want the camera to fire without a memory card, in case you forget to insert one. Image review: 2 sec – I leave this at the default 2 seconds. After you take an image, it will be shown on the rear LCD for 2 seconds. If you want to preserve the battery life, you can turn this off as well. I usually leave both disabled, because lens corrections are only relevant to JPEG images. If you are a JPEG shooter, leaving these on will reduce vignetting and chromatic aberration. External Speedlite control: default – leave this at default, unless you want to change flash behavior. Some settings will not work unless you attach a compatible flash unit. ISO speed range: 100-25600 – this setting affects what you are able to see when changing ISO through the ISO button or through the Quick menu. I want to keep the entire range for ISO selection, so I leave it at 100-25600 range. Auto ISO range: 100-6400 – now this setting is particularly useful when shooting in “Auto ISO” mode. I am not comfortable with noise above ISO 6400 on the 6D, so I keep the maximum range limited to ISO 6400. Min. shutter spd. : Auto – with the “Auto” setting, the camera will automatically adjust the shutter speed of the camera to the current focal length of the lens. When using the Sigma 50mm f/1.4 Art, I noticed that the camera would toggle between 1/40 and 1/50th of a second. For steady hands and good posture, this might be sufficient. However, if you have shaky hands, then the “Auto” setting might not do justice to keep you away from camera shake. If you notice blur in your images, I would change this from “Auto” to something faster than the focal length of the lens. For example, for the same Sigma 50mm lens, setting the minimum shutter speed to 1/60 might be better than 1/40 or 1/50th of a second. And if you set it to 1/125, it will be plenty even for shaky hands. Unfortunately, unlike Nikon, Canon does not allow for automatic “faster” or “slower” compensations and you are limited to 1/250 shutter speed maximum. This is a deal breaker for sports and wildlife photographers, because they have no options for fast shutter speeds like 1/2000. For those particular situations, you will probably be better off turning Auto ISO off. Custom White Balance – unless you have a gray card to set custom white balance, skip this setting. HDR Mode: Disable HDR – this is automatically disabled when you choose RAW format. If you have the Live View switch on the back of the camera to “Movie” mode (red camera), instead of the above Live View menus you will see two movie menus. I don’t shoot video, so these are also set to default settings. Select folder – you can use an existing folder or create a new one where photos will be stored. LCD brightness: Middle – default is good, although you might want to increase or decrease brightness depending on shooting conditions. LCD off/on btn: Remains on – this is used for displaying the information screen. I don’t use the information screen, so the setting is not important. GPS: Disable – I enable GPS when traveling and turn it off if I need to preserve battery life. It is a neat feature that I wish all other cameras had! Wi-Fi: Disable – keep this disabled to preserve battery life and only enable when you need to transmit images or control the camera remotely. Wi-Fi function – Wi-Fi-specific functions. Battery info. – shows battery level. Custom shooting mode (C1, C2) – there are two C1 and C2 setting banks on the shooting mode dial as previously covered. Once you set appropriate settings for a given scenario, you can save them in these two modes. Register settings – this will allow to save your current settings to either C1 or C2 shooting mode. Once saved, all you have to do is switch to the appropriate mode and the settings will be retrieved. I usually save two different scenarios – one for landscapes and one for people. For C1 (landscapes), I have Auto ISO turned off, set to ISO 100. Exposure mode is set to Manual (M). AF mode is set to One Shot. For C2 (people), I keep Auto ISO on, with exposure mode set to Aperture Priority (Av) and AF mode set to AI Focus. Auto update set. : Disable – I do not want the camera to automatically save adjustments in C1 or C2 modes. This way, if I change a setting, it is only a temporary change. If I need to make a permanent change, I go to “Register settings” menu above. Clean all camera settings – this will reset everything on the camera and revert to factory defaults. Camera firmware ver – displays current camera firmware. Safety shift: Shutter speed / Aperture – used when the camera maxes out in Aperture Priority (Av) or Shutter Priority (Tv) modes. For example, if the exposure is too bright and the camera is also maxed out at 1/4000 shutter speed, with this setting the camera will stop down the aperture to balance out the exposure. Tracking sensitivity: 0 – useful for tracking moving subjects in AI Servo mode. Move the slider towards Locked on to keep focus on the subject and towards Responsive to quickly switch between subjects. I leave it at 0. Accel./decel. tracking: 0 – leave this at 0. This setting is used for making quicker focus adjustments to subject tracking. AI Servo 1st image priority: Middle – if set to Release, the camera will fire even if the subject is not in focus. If set to Focus, the camera will not fire until the subject is in focus. The Middle setting is a combination of the two and the camera will try to focus as quickly as possible before taking the shot. AI Servo 2nd image priority: Middle – for the second and other shots in the sequence, the camera can be set either to “Speed” or to “Focus”. In “Speed” mode, the camera will fire continuously, whether the subject is in focus or not. In “Focus” mode, the camera will only fire if the subject is in focus. AF-assist beam firing: IR AF assist beam only – if you have an external flash unit, this setting allows setting the type of AF assist beam to fire, if it has one. Since infrared is more accurate than a regular lamp, I prefer to keep it on IR AF assist. Orientation linked AF point: Same for both vertic./horiz. – you can set different autofocus points depending on the orientation of the camera. I set this to be the same. Superimposed display: On – I want AF points to light up in red when I half-press the shutter button or press AF-ON, so I leave this at “On”. Focusing Screen: Eg – A II – default, only applicable if you are using an optional focusing screen. Warnings ! in viewfinder: When monochrome set, When WB is corrected – shows an exclamation mark in the viewfinder if these conditions are met. AE Lock button: AE lock/FE lock – you can change the behavior of the AE Lock (Asterisk) button as well. Some people prefer to have the AE lock button serve as the AF-ON button. You can do that by changing the mode to “Metering and AF start”. This will help me when i handle my 6D very soon…. Thanks Nasim for your great reviews and articles. They are simple and focused on subject. You are most welcome Rakesh! Great, as usual, Nasim. But please could you give us recommended settings for Oly E-M1? I am very happy not to be carrying around my hugely heavy Nikon gear. And the 12-40 is_ really_ good. And the IS is phenomenal. But the menus? Truly awful. So please could you give those of us who went over to the light side a little help? Recommended settings for the E-M1? Scott, I regret sending the E-M1 back without doing a similar article. Will do my best to get a hold of an E-M1 to write a similar recommendations article. I agree, the menu system on Olympus cameras is very confusing! Nothing wrong with the Olympus menus. Just take your time to figure all the settings out. You’re right about the size and weight advantage, although the Canon 6D is not a huge or heavy camera, especially when used with a compact prime like the 40mm f/2.8 STM. I really missed the full frame quality and returned my E-M1. A Micro Four Thirds or APSC sensor doesn’t deliver the image quality I like. David, we will do our best to add D7000 and D7100 soon. Recommended settings for the Sony A7 would be amazing! Chris, we will certainly work on it! ‘DOF preview button’ tip: most people do not use this, so set it to AF ‘One Shot’ so you can quickly toggle between AI Servo and One Shot (or the other way around). That’s a good tip, thanks for sharing! As the happy owner of a 6d please accept my thanks. Your article was extremely helpful. As a follower of your site and a Canon user I´m really pleased to see one of most cherished cameras, that I use for landscape, here. Very insightful and interesting stuff. Thanks a lot! Hope to see more soon. Nasim, if you get a chance, recommended settings for Fuji x-t1 would be really helpful! Very helpful. Thank you very much and keep up the good work. If you get a chance, could you do the recommended settings for a Canon 60D camera for daylight, night time, or for a concert? All of the things you talk about are very very helpful. Keep up the good work. Recommended settings for 5d Mark III would be great. Would also appreciate settings for 5d Mark III. Just bpught one and don’t know where to start. Your work is so very helpful! Thank you! 1) Color space is irrelevant for shooting RAW, so his advice is only applicable to JPEG. 2) His graph illustrates reds and magentas as being outside sRGB. That’s not correct. If you look at the AdobeRGB color space in 3D and compare it to sRGB, it stretches far beyond just reds and blues – a big part of the missing colors in sRGB are greens. 3) Matrix metering has nothing to do with color! If you shoot RAW, the setting does not matter. If you shoot JPEG, then the setting is important. What would you Recommend for getting the clearest picture of an object or person not moving? Sometimes there is too much noise in the photo. Thanks! Use AV or full manual mode. Lowest ISO, shuttle speed an inverse greater that the leans focal length. Eg 85mm lens shoot at 1\85 or faster. F-stop, choose 2 stops smaller than the lenses widest. 85mm f1.4, shoot at f4 and above. Thanks, I just upgraded to a 6D and this information helps to take some of the upgrade mystery out of the settings. Also to dispel myths and uncertainties about some of the functions. Thanks for the in depth review for the 6d. I needed some brushing up on the camera’s functions and capabilities. Thanks for the helpful hints – I just rented this camera and already love it – will be the next one in my bag!!! If i want to set only file raw when taking picture. It means that after i took a picture i want only raw picture. how do you set that? Thanks for giving me a straight forward and concise explanation of the 6d controls for someone who is just starting out with his first semi-pro camera. Great Article. Thank you. I learned a few things. Especially the Custom functions III. I convert to Nikon to Canon, and then i realize there is a constraint with the Auto ISO (up to 400) in the Canon system. When using flash with Nikon, i dont need to worry too much on the ISO setting ( due to the auto ISO feature), but with canon, the step to get a proper exposure is not as straight forward. I need to take a few trials shoot to get the ideal setting. This is ok if the situation is predictable, but if i suddenly change to a scene different from previous, i run into high risk or not properly exposed. Is there a way that I can mark my photos in camera? Say I shoot 30 photos and want to tag the best 2, is there a way i can do that in camera? Hi Michael, in case you haven’t figured it out yet, there is an amazing way to do this and many Canon users don’t know about it yet. You can set the way in which the camera jumps images. You can jump by 10, by date etc., but also by rating! This means that if you only rate your good photos, you can then use the top of the camera scroll-wheel to go through your highlight selection. A slideshow of only your best pictures, basically. I LOVE this functionality. Normally I shoot in AI Focus mode with auto ISO and single mode, my subjects are kids, but problem is, I couldn’t get hold of right focus when babies are moving.The focus can’t be locked. I tried with all kind of metering mode, no matter what I do it doesn’t get right clarity. Normally one AF enlighten during my shot out of 11. 2) is it possible for canon 6d, that I have center mode on with let’s say 4 side AF dots next to each center? so that I can cover more area for focus? My problem in point 1 is that, only one AF point selected during my shot. 3) my images are very blurry/noisy? so in LR i increase the luminescence to compensate the blurriness, but doing so, It is also missing the area which doesn’t require any luminescence. My ISO is always Auto, but even if I set my ISO 100-400, it doesn’t come near to real images. Can you advice best settings for my camera? I’m thinking that I did a big mistake buying this camera, as my self is not a bad photographer, but I’m surprised to see how 6d has trouble with holding focus. on Canon 6d can you have center AF point and four assist points selected next to it? I can’t figure out a way to do this. I have bought the 6D more then a year ago for a South America trip, with the intention to sell it right after. So, I have read your (rather long article) only to realize the one and only thing which I (personally) had found new and super useful is the very last bullet. I rarely comment on anything, but i have to THANK YOU so much for this little gem hint. I use only one (mostly central) focus point and also my 6D has a EasyCover rubber “suit” on it which makes pushing buttons even more pain. I have just enabled the last setting (change focus point with the multicontroller) and will see how that goes. I have some worries about accidental focus point changes – does that ever happen to you? I found out that my 6D is rather noisy from 1600iso upwards; I limited my auto iso to 3200max. I shoot only RAW and edit my images in Lr. It is way noisier than my Fuji X-E2 that is an aps-c! OK, Fuji are very good in low light/high iso yet this remains a sensor that is half in size..
My settings for noise reduction is -2 which means I do not want any noise reduction whatsover as I want crisp details. Do I need to turn my NR mode to 0 (standard) to achieve better results? I don’t ask to be able to shoot noiseless at 12800 but I expect at least to obtain somewhat clean images at 3200 iso. Great article! Thank you for putting time and effort and sharing the knowledge! My camera does not show the histogram on my new Canon 6D. The only control I can find for the histogram is for brightness. How do I show the histogram in INFO after taking a picture so I can make adjustments for the next shot? Review a photo. Press Info until it appears. Pressing Info when you are not reviewing a photo brings up the level. Ugh. Every time I turn off my camera, the next time I turn it on, my settings are erased. I even have to disable the annoying BEEP every single time. Am I missing a “set” button other than the one that says “set” on the dial on the back of my Canon 6D? Help! I hope you are still responding to comments on this article. Followed your suggestions and have struck a problem. I have the canon 24-70 f4. I am getting into astrophotography. I set the camera at f4, ISO 3200 and 20 seconds exposure. I use manual focus. The problem is that using live view to focus (turn off to take the picture) the camera will not expose longer than 1/30 seconds. If I set the camera at 20 seconds and then turn it to live view the camera resets to 1/30 second. When I flip off the live view it will not reset to 20 seconds. Any idea how I can get around this. Amazing article as usual ! I would also like to have your preferred program settings for shooting landscape photos (AP, Focus, ISO, SS…) & the preferred lens for landscape as well..
I’m so grateful for all your tips. Just bought my 6D and was a bit lost, even though I had my 600 for a couple of years… You put everything in such a simple way, can’t wait to try it all tomorrow. I am a beginner and had Canon Rebel Xsi for over 10 years. Just upgraded to Canon 6D and using 24-105 mm USM lens. I don’t understand many of the menu items and will have to read again and again for better understanding. Overall a great article and easy to understand for a beginner like me. I bought a Neewer TT560 manual flash from amazon (didn’t want to invest too much in the flash) and seeing a lot of blurry images as I feel the flash is not syncing with the shutter speed. I will try the settings you have recommended and see it works. I take a lot of pictures for occasions in the basement where the light is low. Im beginner lavel photographer. . Thanx verry much for information its ver useful for me. .
Hey guys anyone know if the Canon EOS 6d has a panoramic option setting? I need the autofocus point in the camera viewfinder to stand out more. I can not see those well and need to adjust them. perfect job! Thanks a lot! Many thanks for the elective information. I have a question, my camera Canon Eos 6D and my work dealing with conference issue, seminars, students group photos. Whats the best setting from your side to get high resolution images. I just got the 6D recently although Mark II has been released. I thank you very much for the excellent work. I know it takes time to put this material together and I am grateful for your assistance. Take care. are the recommend (photographylife) setting for 6d and 6d2 would they be the same?. I have a 6d2. I’ve hurt my back (fractured vib/spine and do not get out much anymore . thank you in advance art. This is super handy! Thanks for the tips ? I guess I am so new to my EOS6D that you lost me with the setting section. Really great article! Thanks for the tips. Fantastic article Nasim,i was about to give up with the 6d.